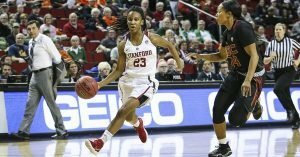 Kiana Williams paced the Cardinal against USC with 18 points. Photo courtesy of Stanford Athletics. For three quarters, USC played Stanford essentially even. The problem for the Trojans was the first ten minutes, which saw the Cardinal start the night on a 12-2 run, en route to an 11-point lead after one quarter. That left the Women of Troy playing catch-up all night, and unable to get the game back within a single possession in a 69-59 loss. Aliyah Mazyck led all scorers with 22 points, and Kristen Simon fell just short of a double-double with 12 rebounds and nine points for the Trojans (20-11, 9-9), while Kiana Williams paced the Cardinal (21-9, 14-3) as one of four to finish in double figures with 18. After the early Stanford run, the gap fluctuated from 14 late in the first, to seven mid-way through the third. A pair of free throws from Minyon Moore with just over six minutes to play brought the Trojans within six, and though USC would hold Stanford scoreless over the next two minutes, three straight offensive possessions came up empty for the Trojans as well. That was a problem throughout the night for USC, which shot a season-low 27 percent from the field. Where the Trojans did keep pace was at the free throw line, making 26-of-29 attempts. And though her team came up short, Moore was proud of the Trojans’ effort. USC now awaits its NCAA Tournament fate. The Trojans are firmly on the bubble, but with 20 wins and nine conference victories, their resume just may be enough to propel them into the field. Courtney Ekmark beats the defense to score. Photo courtesy of Sun Devil Athletics. What’s March without an upset? 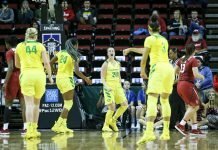 The higher seed had prevailed in the first seven games of the Pac-12 Tournament, and after taking a six-point lead with just over five minutes to play, Oregon State was in position to make it 8-for-8. But the jumper from Mikayla Pivec to extend the lead was the last field goal the Beavers would make on the night. 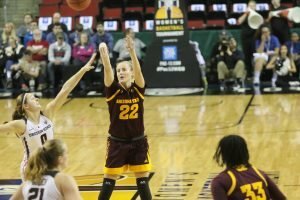 Oregon State missed its final 10 shots, and the Sun Devils scored 13 of the game’s final 14 points to pull out a 57-51 win in Seattle. 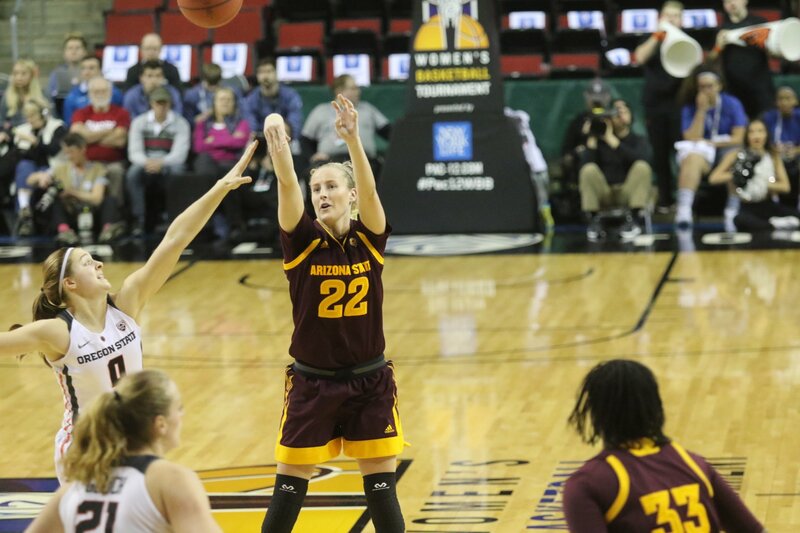 Courtney Ekmark had a game-high 18 for Arizona State (21-11, 10-8), with Kianna Ibis (14) and Robbi Ryan (12) also finishing in double figures, while Pivec and Katie McWilliams both had 14 for the Beavers (23-7, 14-4). Marie Gulich was held to just six points and four rebounds on the night. In front of a staunchly pro-Beavers crowd that made the trip from Corvallis, Arizona State jumped out to an early 10-2 lead, but in a sign of things to come, the two teams combined for just seven points over the final five minutes of the quarter. The Sun Devils took a five-point edge into the break, after a jumper from Robbi Ryan just before the buzzer. ASU pushed that lead to nine to start the third, before the Beavers answered with a 10-2 run. On a night that was marked by lengthy scoring droughts for both sides, a rapid-fire barrage of four consecutive 3-pointers brought some life to both offenses, while a three by McWilliams at the buzzer gave OSU a 46-44 edge. The late spurt of offense would prove short-lived, as the Beavers shot just 2-of-15 from the field in the fourth. Those two shots pushed Oregon State to a 50-44 lead, before the Sun Devils’ fateful 13-1 run to the horn. Oregon State head coach Scott Rueck said the tone was set early by Arizona State. And as the Sun Devils move on, the Beavers are left to wait and see if they will earn a host seed for the NCAA Tournament. The Cardinal and the Sun Devils split the season series, with both teams winning on their home floors. Stanford notched a 73-66 victory on Jan. 7, while Arizona State took the rematch 74-50 on Jan. 26. Though it was unknown during her post-game press conference who the Cardinal would play, VanDerveer had praise for the way her team scouts its opposition. Stanford secured its spot in the semifinals for the 16th time in 17 seasons. The Cardinal has won 15 of those contests. With her 86th 3-pointer, Aliyah Mazyck set a new single-season USC record. 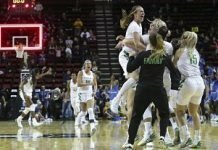 The last time Oregon State failed to reach the semifinals was 2015, when they were knocked off by ninth-seed Colorado. OSU fell to 1-5 on the year when they are outrebounded.